Der Steppenwolf and "荒野の狼" - k0b0's record. 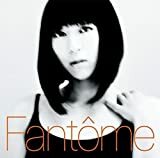 Hikaru Utada's album "Fantôme" is really good. I like the song "荒野の狼" in this album. Perhaps, this song may be influenced by "Der Steppenwolf" which is the book of Hermann Hesse. Thinking that way, I think the interpretation of this song will change. Well, if not, the lyrics and rhythm of this song are beautiful.